Het lijkt erop dat je tas leeg is! Bespaar $8.00 door nu voor die optie te kiezen. toegang tot alle updates van de module/het thema. het oplossen van problemen met de services van derde partijen, de hosting of de server, of met de software van PrestaShop. Is your store already online? Change the way you calculate shipping costs by using the final amount paid by the client (Less discounts) as a reference. Don’t apply free shipping costs if the client does not reach the configured minimum amount. 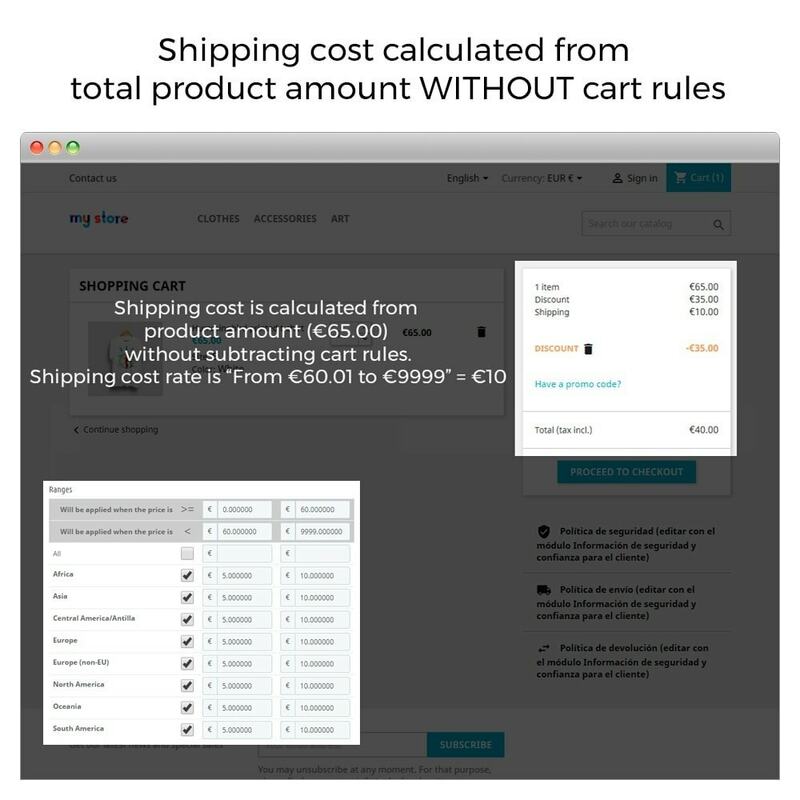 PrestaShop calculates the shipping costs of the order EXCLUDING* the discounts (shopping basket rules). If you apply an incorrect tariff you may end up with a loss. 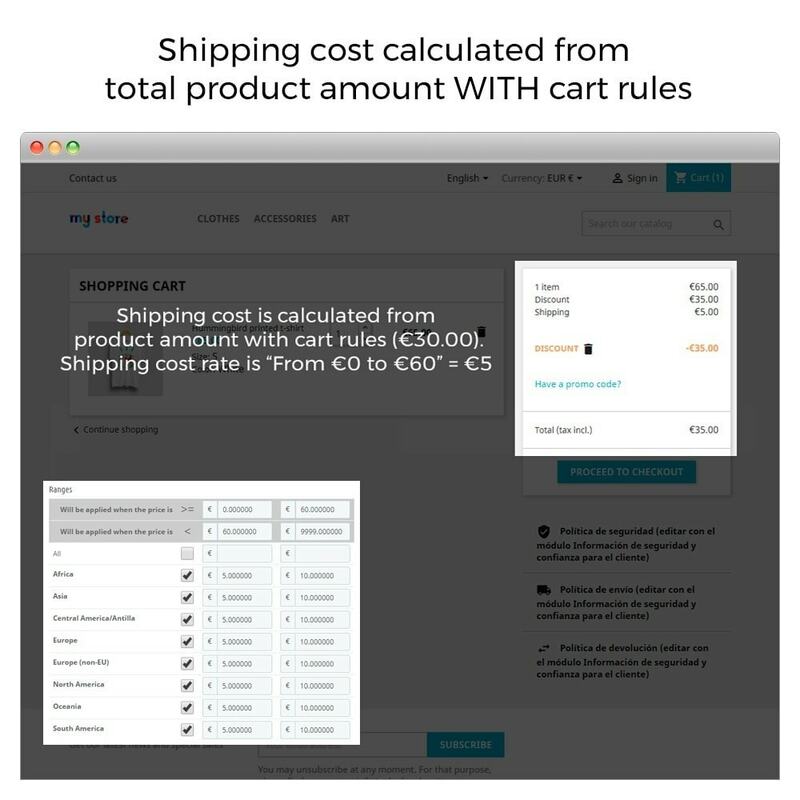 Despite free shipping costs being applied to items over 60€, PrestaShop calculates the shipping costs from the costs of the items without considering the discounts, that is, 65€, and therefore applies free shipping. With this model you can calculate the tariff from the final amount that the client pays, that is, the cost of the items minus the applied discounts. The module also allows you to calculate shipping costs without keeping the discounts in mind, that is, only the cost of the orders. The module has no additional costs. You only need to make one payment for the module licence for your store. 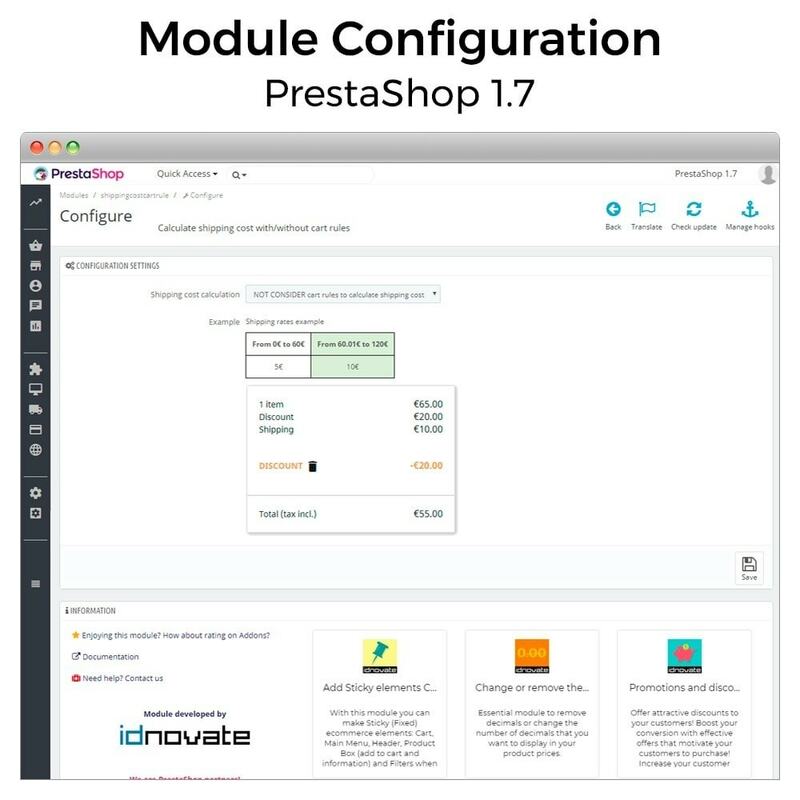 * Some versions of PrestaShop calculate shipping costs from the cost of items minus the shopping basket rules, but equally, it does not allow configuration if the discount rules need to be included or excluded from the calculation of shipping costs. 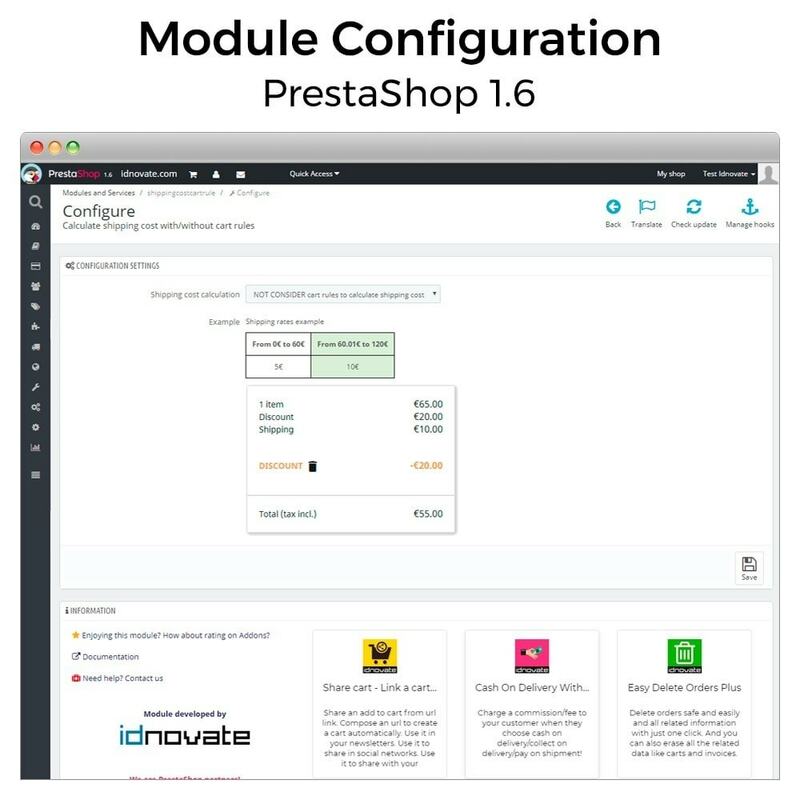 You can use the module in all the stores on your multi-shop, and you can create a different configuration for each of these. This module is adapted for all devices: PC, tablet and mobile. It is also compatible with all browsers. You can use this module with any platform you are using and it will function with any other modules you have installed in your store. If you have any problems, we will resolve them for you. All the texts on this module can be translated into the languages of the store. Give a user extra product info with AN Product Extra Tabs Premium. Create additional description tabs with any format of content - tables, instructions, YouTube or Vimeo videos, cases, looks, reviews etc. Avoid errors with cumulative discounts installing our module.It creates 2 new cart rules actions: - only for the products without other discounts or offers.- only to products with "on sale" disabled. If you need any new functions that we haven’t developed for this module yet, do not hesitate to contact us by sending a message through the “Contact the programmer” option. 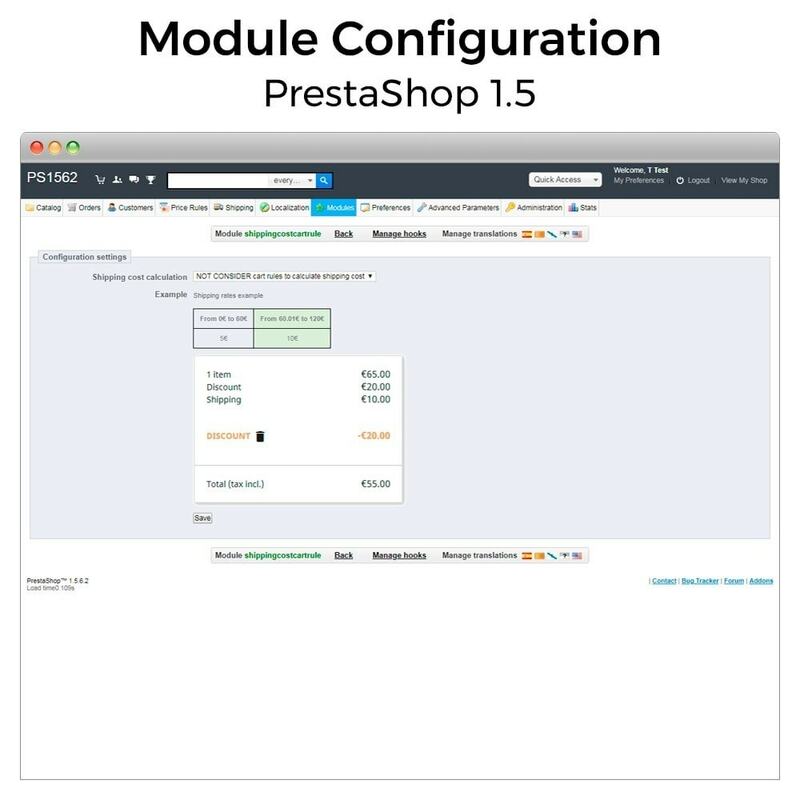 We frequently add updates to the module, to incorporate new functions and to adapt it to the latest versions of PrestaShop. We can help you with the installation and configuration If you have any questions, or a problem emerges during installation and configuration of the module, send us a message through the “Contact the programmer” option and we will help you. 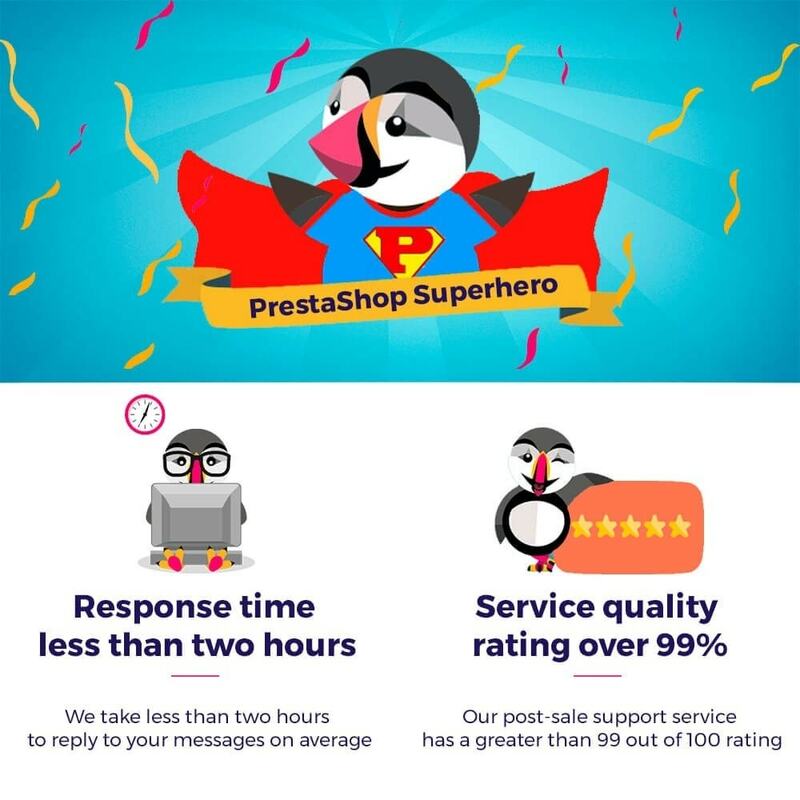 idnovate is one of the best partner agencies certified by PrestaShop, and it is notable because of its Platinum hallmark. It is also particularly notable for its client services, with excellent response times as well as some extraordinary evaluations of its modules, for which it has received the highest accolade of Superhero. 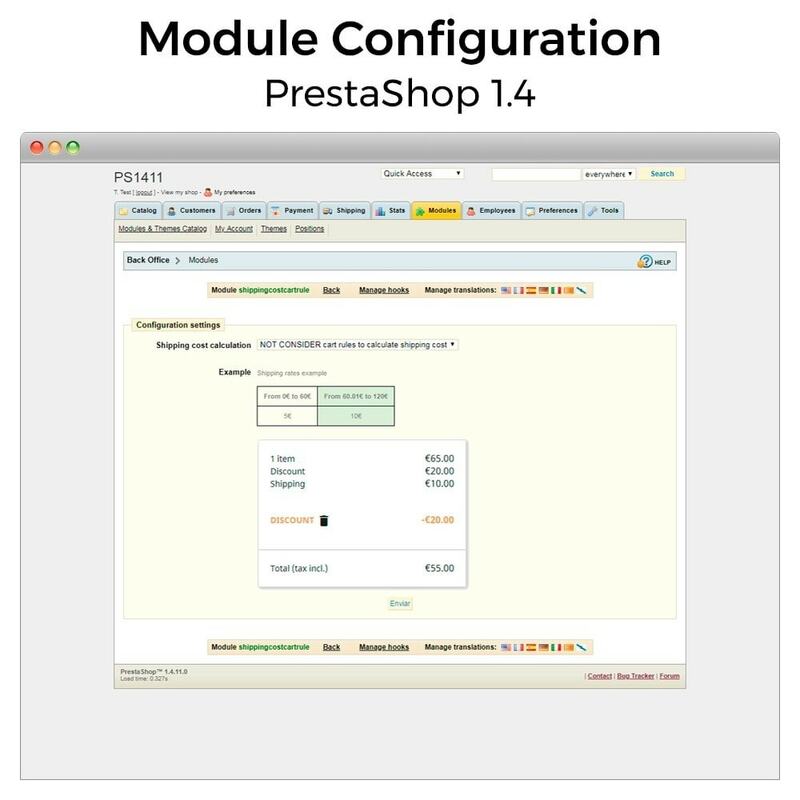 Its modules follow the standards, development guidelines and good practice defined by PrestaShop. U profiteert automatisch van 3 maanden ondersteuning bij dit product. Tot 90 dagen na de aankoop profiteert u van technische en functionele ondersteuning en van toegang tot beschikbare updates voor dit product. Kies de optie Zen om 12 maanden lang te profiteren van een goed werkend product! Met de optie Zen heeft u gedurende een jaar na aankoop toegang tot ALLE updates van het product. De ontwikkelaar van het product beantwoordt via de mail al uw technische en functionele vragen. Wat is de optie Zen? toegang tot alle updates van dit product in deze periode. De optie Zen is tegen een gunstige prijs beschikbaar op het moment van de aankoop van dit product, maar u kunt deze ook aanschaffen na aankoop, dit vanuit uw klantaccount. De optie is geldig tot een jaar na de aankoopdatum van uw product. Hoe vroeger u 'm koopt, hoe langer u ervan profiteert! Wat omvat de Option Zen? 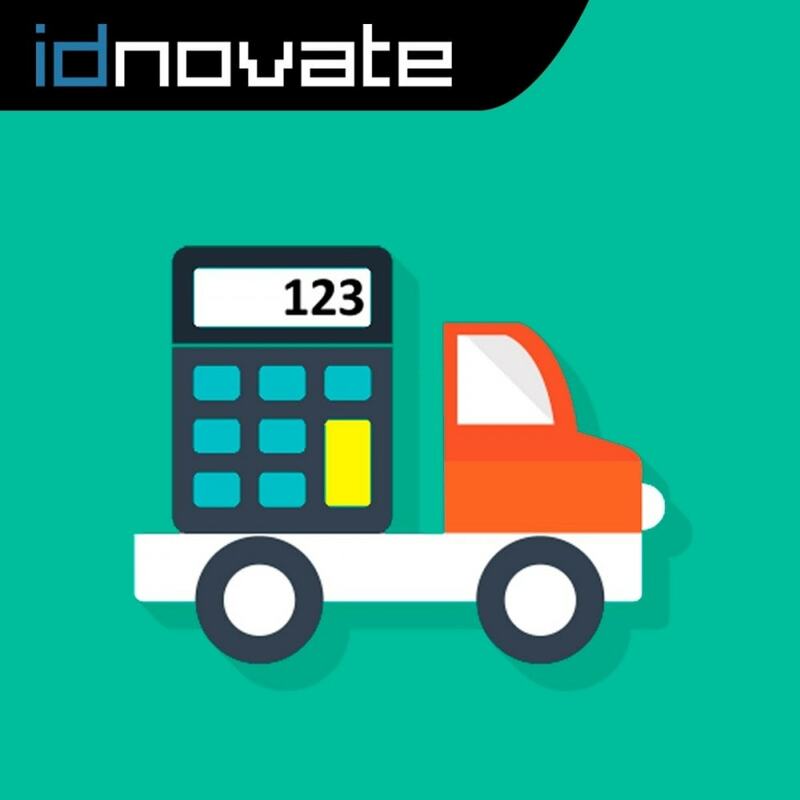 idnovate.com is a Spanish agency with more than 10 years of experience in IT projects, 5 of these in the sector that specialises in the development of eCommerce projects. We develop all kind of modules always following the development standards and guidelines laid out by PrestaShop. In order to achieve the customer's complete satisfaction, we offer an exceptional techical support to ensure the full operation of the modules. Neem contact op met de ontwikkelaar! Charge a commission/fee to your customer when they choose cash on delivery/collect on delivery/pay on shipment!The most downloaded payment method. More than 5,000 downloads and highly rated!The favourite payment method for your customers! This payment module allows your customers to enter their credit card information on your store and let you process the data manually (offline) using your POS payment terminal. Increase your benefits. Offer your clients attractive discounts! Increase your conversions with effective promotions that promote sales! Increase your ticket by purchasing more items to get more discounts! Vragen? Neem contact op met de ontwikkelaar! Jouw email By submitting this form, I agree to allow PrestaShop S.A. to use of the registered email address for sending newsletters and promotional offers. check U bent er bijna! U hoeft alleen nog maar te klikken op de link in de e-mail die we zojuist naar u hebben verstuurd.Bedankt voor uw inschrijving! Cookies zorgen ervoor dat onze diensten vlot te gebruiken zijn. Door deze te gebruiken, accepteerd u het gebruik van cookies.